Born into a Jewish family in Bulgaria, Sofia, Weissenberg began taking piano lessons at the age of three from Pancho Vladigerov, a Bulgarian composer. He gave his first public performance at the age of eight. In 1941, he and his mother tried to escape from German-occupied Bulgaria for Turkey, but they were caught and imprisoned in a makeshift concentration camp in Bulgaria for three months. In 1945, they emigrated to Palestine, where he studied under Leo Kestenberg and performed Beethoven with the Israel Philharmonic under the direction of Leonard Bernstein. In 1946, Weissenberg went to the Juilliard School to study with Olga Samaroff. He also studied with Artur Schnabel and Wanda Landowska. 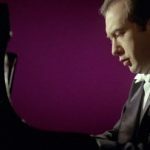 In 1947, Weissenberg made his New York debut with the New York Philharmonic Orchestra and George Szell in Rachmaninoff’s Piano Concerto No. 3 and with Philadelphia Orchestra and Eugene Ormandy, with which Weissenberg won the Leventritt Competition. Between 1957 and 1965, he took an extended sabbatical for the purpose of studying and teaching. Weissenberg resumed his career in 1966 with a recital in Paris. Later that year he played Tchaikovsky’s Piano Concerto No. 1 in Berlin conducted by Herbert von Karajan, who praised him as “one of the best pianists of our time”. Weissenberg gave piano master classes all over the world. With his Piano Master Class in Engelberg (Switzerland), he had as students many pianists of the new generation: Kirill Gerstein, Simon Mulligan, Mehmet Okonsar, Nazzareno Carusi, Andrey Ponochevny, Loris Karpell, and Roberto Carnevale among them. He composed piano music and a musical, Nostalgie, that was premiered at the State Theatre of Darmstadt on October 17, 1992. Weissenberg died on January 8, 2012 at the age of 82.